would card:Daring Apprentice become untapped if i use his ability and the regenerate him??? How does Horobi, Death's Wail interact with Equipment and targeting effects? Fireshrieker and Grappling Hook . Odious Trow for the Gift of the Deity combo. Blessing of Leeches so Virtus can attack even if he isn't unblockable. Yes, the second ability stacks. The ruling from Gatherer "Each time Vizkopa Guildmage’s second ability resolves, a delayed triggered ability is created. Whenever you gain life that turn, each of those abilities will trigger. For example, if you activate the second ability twice, let those abilities resolve, then gain 2 life, each opponent will lose a total of 4 life." I like your additions. Endrek Sahr, Master Breeder is great, just make sure to sac those thrulls before they kill him. Thrilling Encore is a budget version of Rise of the Dark Realms and is a good placeholder until you decide you want to make that investment for your black commander decks. As for cards to cut, I would probably cut Blessing of Leeches , Soulmender and Dutiful Thrull . There are a few other cards that that aren't on theme like: Aegis of the Gods , hexproof is good, but the creature is easy to kill. High Priest of Penance is a sold card but you want to give it indestructible or at least more toughness so you can abuse the damage trigger. Also I would look at your high casting cost spells, if you don't see them making a big impact on the game you may want to switch them out. Lich's Mastery means you die to any type of Disenchant , which is a big risk. Gravewaker takes 13 mana to reanimate a creature Debtors' Knell is right at the edge of your budget, but is a better card. Plea for Guidance can only find 8 cards in your deck, and black has so many other tutor options. Excited to see that Haunt performed well. 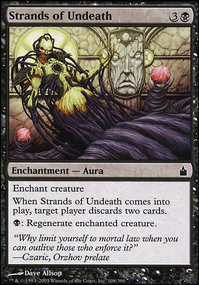 I feel like it might get hated out of games without protection though, maybe run Imp's Mischief , Soul Channeling , or Blessing of Leeches to keep Haunt alive. Sudden Spoiling can also open up an opponent's board for an attack or stop creature combos. I think I understand the combo, but why Wild Dogs and why Blessing of Leeches ? you could use Conviction, Brilliant Halo, Gossamer Chains, Cage of Hands, Shackles and Mourning for repeatedly trigger Underworld Coinsmith. Ashes to Ashes, Read the Bones, Night's Whisper, Sign in Blood, Angelic Purge, Afterlife, Snuff Out, Unmake, Pentarch Ward, Cho-Manno's Blessing, Blessing of Leeches are all really good and serve you as card draw/ protection or control. maybe think on adding something like Pestilence or Shrivel/Nausea for boardwipes like effects. for starters you could cut down on creatures like: Aether Poisoner, Child of Night, Daggerdrome Imp, Deathgaze Cockatrice, Farbog Revenant, Feral Abomination, Fetid Imp, Flensermite, Giant Scorpion, Hand of Silumgar, Hired Poisoner, Markov Patrician, Maze Abomination, Moonglove Changeling, Moonglove Winnower, Nirkana Assassin, Queen's Agent, Rancid Rats, Ruin Rat, Scrounger of Souls, Sidisi's Pet, Skittering Heartstopper Vampire Champion and replace others for: Black Cat, Burglar Rat, Cadaver Imp, Liliana's Specter, Ravenous Rats, Twisted Abomination, Gurmag Angler but would compite with Shambling Attendants for the gy. 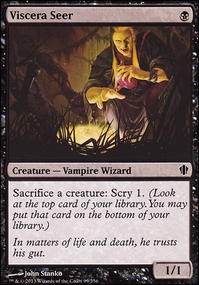 some usefuls spells you might replace or add cound be: Blessing of Leeches, Sadistic Glee, Soul Channeling, Ashes to Ashes, Evincar's Justice, Shred Memory, Dark Bargain, maybe Crypt Incursion. im out of ideas for cards, for now, and you could add more artifact ramp or artifact that can be creatures like Guardian Idol, Wayfarer's Bauble is in every deck i play, Relic of Progenitus and Nihil Spellbomb are always good gy hate. Arc-trail Hardshell: Way too cheap compared to Bramblecrush and way too big compared to Mold Shambler. Needs to have a higher manacost and a smaller body. Sharptooth Croc: He looks fairly balanced when compared to Two-Headed Zombie and Dross Crocodile, but for a Primal creature, I think the high power makes it too desirable to have Menace. To make it more of a choice, compared to the Zombie, I'd vote, make it a 3/2, Primal 1. Also, why does a Croc have the creature type "Alligator"? Hunting Settlement: The ability that gives your creature Lifelink will prevent them from getting benefit from Muraganda Petroglyphs style-effects. I think that would be an unfortunate interaction. The ability should change. Tibalt, Havoc-Bringer: should a mono-red planeswalker summon red and black critters? Wooly Grazer: this ability would go perfect with Primal. Ubo-luk's Idol: the wording is awkward, and the effect is insane powerful for the cost. It's like your own personal Wheel of Fate, but you're not forced to use it during a later upkeep, you can use it at any time. That card would be banned for the same reasons as Smuggler's Copter. Needs serious power reduction. Ancient Gharial: They use the creature type Crocodile, now. Even Rootwater Alligator is officially a Crocodile in Oracle text. Basking Plaeosaur: I'm not sure how much I like the "enter the battlefield" ability with Primal. IF you don't want to make it "Primal 2", then a sacrifice-type ability like Viridian Zealot would definitely be worth only +1/+1. Bloodfall Axe: The equip cost is prohibitive. The Murderer's Axe cost worked because the set had a Madness theme. The effect is just Barbed Battlegear. It might work if it had a Skullclamp on death ability, to recover the cost. Chieftain Ubo-Luk: I'd compare him to Sek'Kuar, Deathkeeper. He should make simple 1/1 red goblins (to stay on theme with "no abilities") whenever any nontoken creature you control dies, not just Goblins. I would say instead of giving an ability like Menace, (because it goes against the theme), it should be the simple "can't block" ability. Clever Improvisor: It's insane that he makes better equipment than the Conch-tipped Spear. They should be +1/+1. Also, instead of making it every creature that enters the battlefield after him, just create 4 of them, kinda like a slower red Verdurous Gearhulk. Otherwise, there will be an ever-increasing supply of power that will never leave the battlefield. Cloak of Leeches: I would say you should vote to avoid giving the creature an ability. 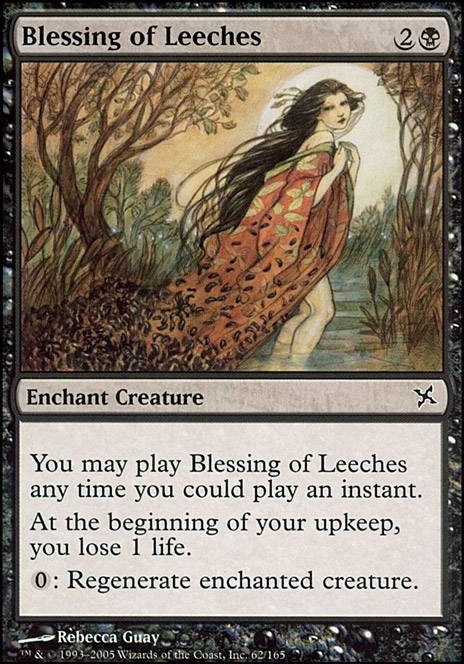 Something like Blessing of Leeches would be interesting, since they no longer use regeneration. Conch-tipped Spear: It's a No-Dachi. Can you do anything more on-theme, that doesn't give the equipped creature an ability? Daelin's Spellbinder: This card seems almost too powerful. The "nontoken creature" thing is awkward. Can it be "discard a card" or something more elegant? Diving Fluoraptor: His activated ability is too expensive. It could be the same as Bloodpyre Elemental without too much loss, or cost only 2 and stay instant. Downpour: I think this effect has incredible potential. Instead of a sorcery with bulky rules text, an instant "Tap all Permanents" would basically be the same thing, with far more simplicity. Egg Nabber: Just exile the card, and skip the craziness. Encase in Magma: Cannot be allowed to enchant enchantments; it's not red's deal. 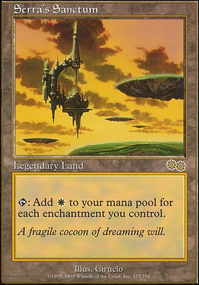 It should just be a colorshifted Imprisoned in the Moon. Enraging Provocation: I dislike having a temporary ability and a permanent effect on the same card. I don't have any examples of any cards that do this. Enriching Pitcher Plant: Love it. Enticing Pollen Spewer: I think it's too expensive, when we compare it to its symmetric counterpart: Rage Nimbus. Fangs of the Terrosaur: Perfect equipment for this set. Fight Once More: It seems out of place on a world where humans are basically cavemen. 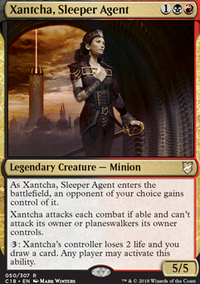 It would be more on theme with a set like Innistrad, but here it's not really on flavor with primitive tribal humans. Flame-Spewing Ruckus: I don't understand how this card is meant to be used: the turn you play it, you could pump your two creatures with prowess triggers, but the goblin can't attack without Haste. 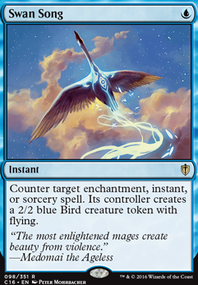 It would be interesting to have an enchantment "whenever you play a noncreature spell, enchanted creature gets +1/+1 until end of turn" (because I don't think you want to avoid effects that give creatures abilities in this set). Fossil Sage: This might not be the right card for this set, because reanimating a creature with an extra ability plays poorly with Primal. You will always want to not make the token Primal, so you can keep the indestructibility. I'll write some more thoughts later, since I'm only up to F.